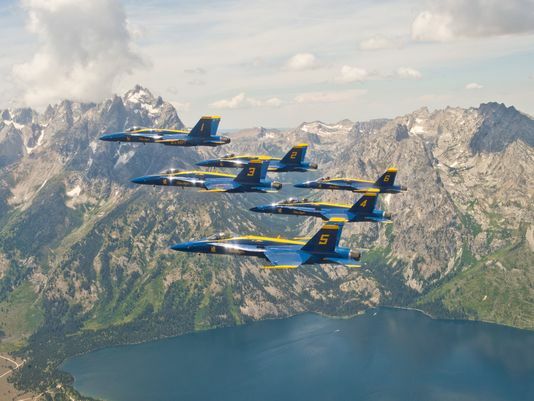 FARGO, N.D. – The iconic Blue Angles squadron was captured in stunning fashion as they flew over Grand Teton National Park on Tuesday. The photo, taken during their flyover of the park on July 21, shows the six jets in their F/A-18 Hornet Delta Formation mid-flight above the Grand Teton mountain range. The Blue Angels are the U.S. Navy’s Flight Demonstration Squadron. Grand Teton National Park is roughly 310,000 acres (484 square miles) in Wyoming, and includes 40 miles along the Teton Mountain Range. The team flew twice over the park, with a seventh jet flying alongside to capture the photo. Park-goers stopped to watch as the planes flew by around 12:30 p.m. The Blue Angels are scheduled to fly in 68 performances at 35 locations in 2015, and have 69 performances booked for 2016 across North America. For more information on the squadron, visit www.BlueAngels.navy.mil.